Model D10096-000 Master Reference Unit is designed to handle a variety of applications in which signal conditioning and multiple outputs are required while maintaining input to output circuit isolation. 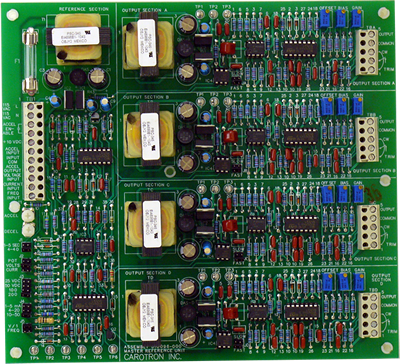 Each Model D10096-000 can supply four separate outputs that are each isolated from the master reference signal and also from each of the other outputs. If more than four outputs are required, two or more units may be ganged together. A variety of inputs are acceptable as sources for the master reference signal. A+10 VDC voltage is available to allow the master signal to be sourced from a 2,000 to 10,000 Ohm, 2 Watt potentiometer. The potentiometer signal is supplied through a linear acceleration/deceleration circuit with two selectable ranges. A customer supplied contact closure enables the acceleration/deceleration circuit and allows the reference to accelerate to a level set by the input potentiometer. The deceleration circuit operates whenever the reference is lowered. When the enable contact opens, the reference is zeroed immediately. Additional inputs are four selectable voltage ranges, three selectable current ranges and a square or sine wave frequency input. These inputs bypass the acceleration/deceleration circuit. Four identical output circuits are sourced from the master signal. Each output has separate OFFSET, GAIN, and BIAS adjustments to tailor the output signal. An optional Trim potentiometer input is also provided to allow the output to be remotely ratioed.